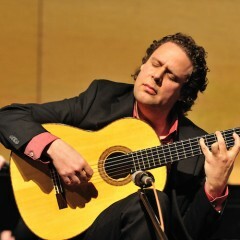 Acknowledged worldwide as a rare talent in flamenco and classical guitar genres, Adam del Monte transcends labeling and convention as a performer and composer in both genres. He incorporates a wide array of musical styles in his compositions for a unique sound and language of flamenco that is steeped in tradition and also progressive in its openness to musical flavors from around the world. He has recorded for Deutsche Grammophon as featured flamenco guitar for the double GRAMMY® Award–winning opera Ainadamar (2006) by Osvaldo Golijov, with soprano Dawn Upshaw and the Atlanta Symphony, led by Robert Spano. Since then he’s been invited and continues to travel extensively around the world to perform at prestigious venues such as Carnegie Hall and Lincoln Center, Barbican Center London, Colorado Music Festival, and Chicago Symphony’s Symphony Hall among many others. In 2011, del Monte performed Ainadamar in the 60th anniversary of the Festival de Granada at the Alhambra Palace with the Granada Symphony Orchestra. He has been invited to the International Flamenco Festival in Los Angeles at the Redondo Beach Performing Arts Center as a soloist and with his flamenco ensemble, in 2010 and 2012. He has recently recorded a feature song as the on-screen hands in the movie Wanderlust (2012). Other movie music credits include features in Knight and Day (2010), Toy Story 3 (2010, with music by Randy Newman), and Mr. and Mrs. Smith (2005), featuring the music of John Powell. He recorded the solo guitar version of “Avner’s Theme” for John Williams’ soundtrack to Munich (2005), by Steven Spielberg. Del Monte also composed the music for the short film Soledad, which won the Hollywood Film Festival Award in 1998. Del Monte recently debuted his second flamenco guitar concerto, Paisajes, commissioned by the St. Monica Symphony, at SGI Auditorium in Los Angeles. His first flamenco guitar concerto, Ensueño Flamenco for guitar and orchestra, was premiered in Boston by the Boston Modern Orchestra Project at Jordan Hall, led by Gil Rose. He was commissioned by the Los Angeles Guitar Quartet to compose a progressive flamenco piece, Cambio de Aire. He has collaborated with Yusef Lateef and the Atlanta Symphony, under the baton of Yoel Levy, at the National Black Arts Festival in Atlanta.In 2008, he performed his flamenco concerto, Ensueño Flamenco, and Concierto de Aranjuez in Israel with conductor Nir Kabaretti, celebrating the union of the classical and flamenco guitar. Other performances of Concierto de Aranjuez include those by the California Philharmonic conducted by Victor Venner at Walt Disney Hall, the Pacific Symphony with Carl St.Clair, and the Los Angeles Philharmonic led by Miguel Harth-Bedoya at Dorothy Chandler Pavilion. He later made a return visit to the Hollywood Bowl with his flamenco ensemble in a special collaboration with Spanish dancer Lola Greco. Other collaborations with the members of the LA Phil include an appearance in the Chamber Music Series at Walt Disney Concert Hall with Mark Kashper. In 2007, he joined the Falla Guitar Trio, where he has an active schedule of playing chamber music with Kenton Youngstrom and Gyan Riley. He studied both classical guitar and flamenco in Spain, Israel, and England—training with such famed Gypsy performers as Pepe “Habichuela”, Paco Cortez, “Niño” Miguel, and Gerardo Nuñez. His classical guitar teachers were Menashe Baquiche in Israel, and Gordon Crosskey at Chethams School of Music, and at the Royal Northern College of Music, Manchester, England. At age 19, del Monte began his professional career by collaborating with legendary flamenco singer Enrique Morente and the Madrid Symphony Orchestra at the Teatro Real in Madrid, and later at Teatro Manuel de Falla in Granada. In 1992, he was invited to perform in the 500th anniversary of Columbus celebrations in Paris and Madrid. Del Monte’s most recent flamenco CD, Asi Lo Siento Yo (2010), features an all-star cast of musicians, including bassist Carles Benavent, flamenco pianist Pablo-Ruben Maldonado, and flamenco singer Guadiana. His flamenco debut CD on the Spanish label Sonifolk (1998), Viaje a Un Nuevo Mundo (Journey to a New World), was most favorably reviewed by Spain’s most acclaimed flamenco critic Angel Alvarez Caballero as well as Miguel Mora of El Pais, and Alfredo Grimaldos of El Mundo. Other discographies include Mel Bay Artist Video Series a classical and flamenco recital, and “EZORDIO” on GSP label. Del Monte joined the studio/jazz guitar department at the USC Thornton School of Music in 2000, and teaches flamenco and classical guitar.